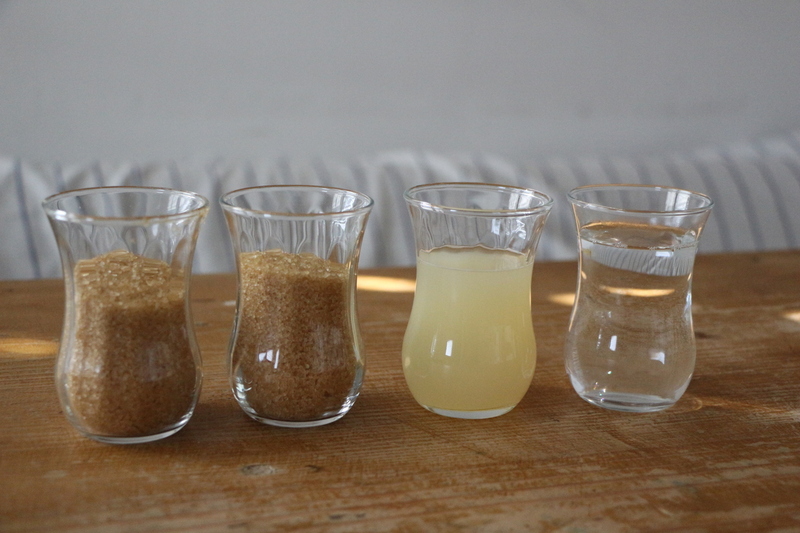 Sugar, water and lemon juice – that’s all you need for sugaring paste. We show you how you can make it yourself and get rid of unwanted hairs gently. If you’d like to remove unwanted hair from your arms, legs, or face, there are several ways to go about it. Many people resort to questionable chemical creams, wet razors that produce unnecessary waste, or expensive peeling devices and wax strips. But have you heard of Sugaring? It is much gentler for you and better for the environment. Sugaring is a proven method of hair removal that originates from Persia, where it is offered in Hamams – the traditional steam baths. The sugar paste – called Halawa – is a mixture of natural ingredients including sugar, water, and lemon juice. Similar to waxing, the paste is applied to the skin. During removal, the unwanted hair is pull away. First, pour all the ingredients into a sauce pan and bring it to boil, stirring constantly. 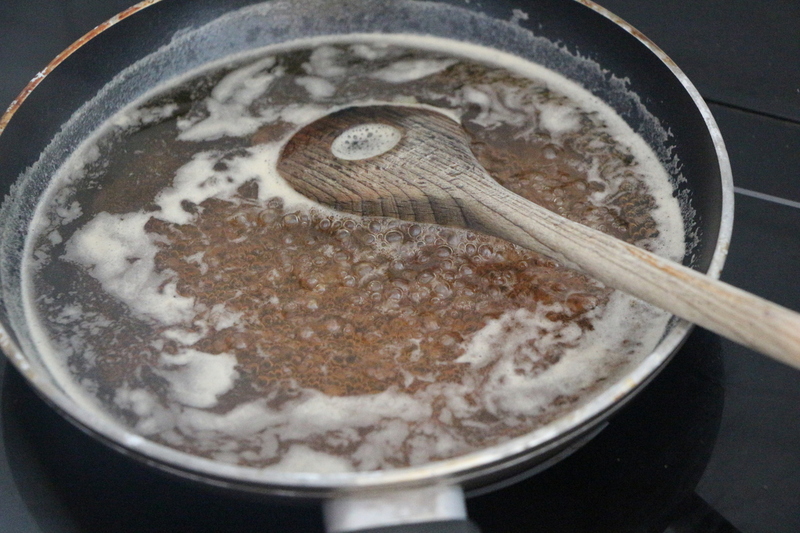 As soon as the mixture begins to bubble, remove the pot from the heat and continue stirring until the bubbles disappear. Then put the pot back over the heat and let the contents boil again. Repeat this process until you get a viscous, honey-coloured mass. If the paste has become hard and brittle, it can be revived with a little lemon juice. If you suspect it is still too thin, just take a spoon of the paste and put it in a glass of cold water. If it dissolves in it, you have to let it simmer even more. Once the mixture has reached the right consistency, remove the pan from the stove and allow the sugar paste to cool to body temperature before use. Your skin must be clean and free of excess oils or body lotions. Baby powder can help keep the skin clean and free of oil. Take a small portion of sugaring paste, about the size of a walnut, and knead it in your hand until it is soft and supple. Apply the paste to the skin against the direction of hair growth. Pull off the paste with several quick jerks in the direction of hair growth. You can reuse the piece of sugar paste until it becomes too weak to be effective. Then take a new portion of paste from your pan. It takes a little practice at first, but you will catch on pretty quickly. Tip: If you have misjudged the amount, you don’t need to throw away the unused sugaring paste. Pack it in an airtight container and put it in the fridge. It will keep there for several weeks without any problems. Thorough hair removal: Thanks to the tiny sugar molecules that penetrate better into the hair’s surface, the hairs do not break so easily and can be more thoroughly removed. Less painful: Sugaring removes the hair in the direction of growth, which is less painful than waxing. In addition, the sugaring paste loosens from the skin more easily than wax, leading to less skin irritation. Slows hair growth: Unlike shaving, sugaring removes the hair from the root, slowing down hair growth. In addition, the hair should grow back thinner and lighter after the treatment. 100% natural ingredients: Sugar, lemon juice, and water contain no allergenic ingredients. Sugar is even antibacterial! Minimizes packaging waste: Wax strips and razors are often elaborated packaged. If you make your own sugar paste, you only need an old jar to store your unused paste in the refrigerator until it’s time for your next application. If you end up not wanting to make the sugaring paste yourself, it can often be found ready-made in drugstores.